In the good old days, I’d turn up to the game with a rulebook or two and have fun. Now it seems, I need dozens of books to have fun. What happened? Last week, I blogged about when everyone is special, no one is special. Doing so got me thinking again about options and the profession of them in the games I love to play. I recently re-watched the amazing video, Paradox of Choice by Barry Schwartz over at TED.com. It’s one the best, most informative videos I’ve ever watched. I highly recommend it, if you have a spare 15 minutes or so. 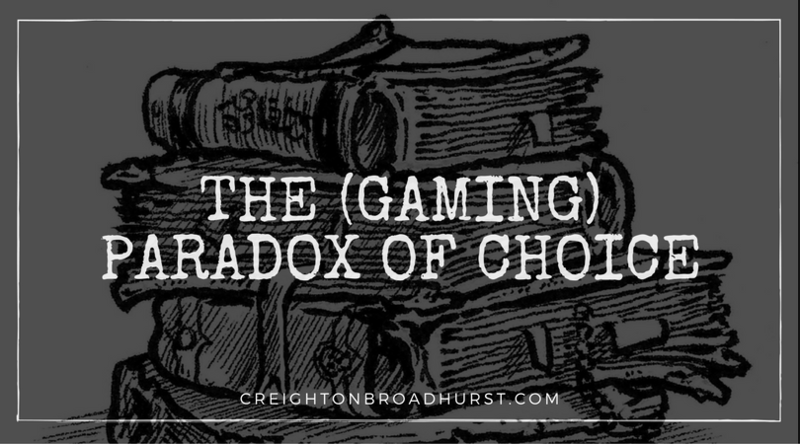 It’s a very thought provoking talk and (inevitably) I wondered how it might apply to gaming. In brief, Barry’s position is that choice is good for us, but too much choice is bad for us. With crazy amounts of choice it is virtually impossible to make the best choice. This inevitably makes us feel bad about our choices (once we’ve eventually made them) because we know — or at least suspect — we could have made a better one if we’d just expended a little more effort. In essence, we’ve failed to do the best we could. Since the start of 3rd edition (and before that the tidal wave of 2nd edition “Splat books”), we’ve become obsessed with options – particularly options for our characters. A couple of years ago, I participated in a high-level 3.5 game and several times I had conversations with friends about their characters that end with something like “I’m sure there’s a feat/spell/magic item for that – you just have to find it.” While that’s not intrinsically bad – I like doing cool stuff with my characters and I’m guilty of optimisation from time to time – I wondered if not having all these options would really degrade my fun level. To compound this, we started a new campaign shortly thereafter and had to make new characters. This filled me with terror because of the sheer quantity of books I “should” take with me to get the “most” out of character generation (and also because I can’t roll stats for toffee). Looking at my bookshelf, I needed to take the Player’s Handbook (obviously), but if I wanted to make full use of the official options available to me I also needed the eight Complete books, four Race book, Spell Compendium, Player’s Handbook II and other bits and pieces. If I wanted to play a particularly strange character I needed to add another ten official books or so (Sandstorm, Races of the Dragon etc.) In total, I’d be potentially using something in the region of 27 books to make a 1st-level character. Of course, I don’t *need* to use that many books, some will likely be irrelevant to my concept, but there’s always a nagging feeling I need access to that many options to play a really cool character; you know – one I haven’t played before. Many factors play into our lust for options. One is the sinister allure of system mastery: the desire to make the absolutely best character (mechanically) by choosing from as many options as possible. Stuff in the non-core books is invariably more powerful or less balanced. This isn’t intentional on the designers’ part (I hope). Rather these rules options are inevitably tested less than the core material or it interacts with other feats, skills or whatever in unintended ways. Thus, I “need” those books and options to have a character as powerful as my chums! But just for fun, let’s look at the bog standard 3.5 Player’s Handbook (or Pathfinder Roleplaying Game Core Rulebook). The books contain seven races and eleven classes. That gives 77 basic combinations to play – more if you take into account alignment, clerics’ deities, specialised wizards and, of course, multiclassing. I play D&D (and Pathfinder) a lot, but there is no way that I’ve even come close to playing that many different characters in the last four decades. I doubt, I’ve even played 10% of the available combinations. Of course, there are some I’m not interested in playing – a gnome paladin springs to mind – but even taking those out of the equation I’m still left with a world of choice. I’m beginning to think all these options are not worth the bother. I get why companies publish this kind of stuff – hell, I’ve done so in the past myself – but I’m not sure I personally need so much choice any more. I don’t know about you, but I’ve got a rather busy life. 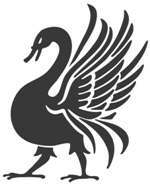 What with my family, Raging Swan Press, running, gaming and my other hobbies my spare time is valuable. Thus, for me, the 20/80 rule has to apply to my gaming. If using only the Player’s Handbook makes me 80% happy with my character and it only takes me one hour to generate why spend another four hours of my busy life hunting through all the other books to find the one feat that might make me 90% or 100% happy? The expenditure of effort far outweighs the payoff. Perceptive readers will notice that thus far I’ve spoken of character exclusively in term of mechanics. I think it’s easy to lose sight of the fact that the mechanical aspect of a character is only part of the story. When you start considering a character’s background, personality, goals and dreams, appearance and more your options truly explode. Even if you’ve just played an elven wizard it doesn’t mean your next elven wizard has to have the same personality, background and so on. They can be completely distinct characters even though mechanically they are similar. If you love options, I’m not saying you are playing wrong. If you are having fun, rock on. What I am suggesting is that you can have as much or nearby as much fun with a simpler, streamlined game for far less effort. Have a go, and see how you fare! So that’s my take on options in gaming at the moment. Do you game with only the core rulebook or do you allow anything published into your game? Let us know you experiences in the comments below, and help your fellow gamers game better. I find that not optimizing your characters is often the most fun. My group keeps things really loose and silly for the most part though. Nobody optimizes, we work mainly out of the core 3 books, we keep things really loose, and everyone has fun with their characters. Will all just sit around the table and tell the story. Restricted options mean choices the players make are meaningful. If everyone can do 5d6 damage a round, then a certain element of play becomes boring. But if a fighter can do 1d10 every round and a wizard can do 5d10 every hour or so, there are tactical options the players make and thus engage in the game. There’s a lot to be said for taking stuff out, thus limiting choices. I don’t use every monster in every bestiary, nor do I hand out many magic items. I refuse to let magic become “the answer.” Players remember the effort they had to take to win and make it home alive. They don’t remember the video game they used “god mode” to win. One of the things I enjoy about gaming is the character creation process. It allows me to use my imagination to come up with a concept for my character and flesh it out. More options allows you to create the character you envision, whether it is of your own design or to recreate a character you loved from fiction. I think the uniqueness of your character and these personal touches allow you to identify better with the character youa re playing, to become more imbued with the game than can be achieved using a generic character. If all of the theives have the same abilities, then how is your theif any different from any other in terms of game play? It isn’t. You can role play personality and make choices, but if their are two theives ion the party, they are pretty much interchangable in terms of adventure goals. I don’t want to play the quivalent of pre-rolled characters. I want a character with unique characteristics and individual skills, flaws, and abilities. I will live with this character for the duration of a campaign, he needs to feel like a person rather than a video game rip-off. There are as you said in your example 77 combinations in the basic pathfinder stuff. I will trust your math as I don’t have the books. But are all 77 itteratios things you actually want to play? Probably not. There are types of characters you want to play more than others. Players tend to repeat personalities and styles from characters they have enjoyed in the past. More options allow you to play the same character type, without repeating yourself. All this being said, we are going to be playing in a 2e Spelljammer campaign. I helped one person to cteate her cleric using PO:S&P, while I likely will choose a standard elf wizard for my own character. I am strongly in favor of more options to let the player build the character he envisions his character to be. we played lankhmar years ago, and every player had a few levels of thief ( it was called thief back then, oh the days…). and where i can see where you are coming from all of those characters were played totally different, its a shame when people cant get past thier class when defining thier character. in your example of using video games to come up with character ideas it is all down to the original idea and how the player interprets that. the witcher is obviously a two handed fighter but what are his other clases, rogue for the traps? alchemist? mage? cleric of the relevant magic god. in this instance having loads of options is a good idea i feel, so the player can re-create the character from the games he feels a connection to and therefore carry on his story? I believe in allowing some option character builds if the player can justify the build rather than making an uber-character (“but the Paladin I want to make will be able to do more damage with a katana! What do you mean I can’t wear full field armor using that sword?”). I’d suggest you make the players in your next campaign ‘earn’ the right to play a particular race/class combo. Much like the starter adventures with 0 level characters if you want to be something _other_ (in my 1E case) than a member of the base four (F/T/M/C) + race you have to RP your way to it. Want to be a halfling Cleric/Thief of Brandobaris? show me In Game why you are that way. Convince me you will do whatever it takes to get what you want and I’ll let you eventually (maybe around the same time a Bard would be done, perhaps earlier) be that character. Good idea, Alexander. I had a similar situation in my Borderland of Adventure campaign a couple of years ago. I player wanted to play a samurai and we worked together to design a background that made sense (as the campaign took place thousands of miles away from any samurai-style cultures). It grounded the PC in the campaign and gave his player loads of great hooks to play off. It made him special and unique (in a good way). Sadly, he died holding off a pack of orcs so his companions could escape a disastrous foray. It was one of the best deaths ever. there are lots of books that provide you with more choice than DND in a smaller, better organized, package. i don’t think too much choice is bad it’s just some game companies organize the choices poorly, and some players don’t think of their options efficiently. build the character (appearance, personality, history, goals, allies, enemies, fighting style, mentors, abilities) then stat them into whatever system you’re gaming with and you won’t have any problems, unless the system is extremely limited in the choices it offers you. in which case it might be a good idea to look for a new system. Do you have an example game I could check out. I’m a bit geeky and love looking at how different companies organise their books. It’s professional research for me! he ran in circles, til he dropped dead! I am with you. When I play Pathfinder, I try to stick to the core book as much as possible, if my character concept cannot be achieved with that alone, usually I am willing to change the concept. Now, admittedly, my last Pathfinder character was a kobold, so, I used the Kobold section from the ARG as well, but that was it. Now, when I am GMing PF, I let the players use anything from an official Paizo source as long as I have had a chance to review it. I want them to be happy with the character, but I am happier just using the Core as much as possible. I’m starting a new strand to my Borderland of Adventure campaign soon, and we’ll be doing Core only. I’m so looking forward to it. This has always been a huge part of why I have always had one big rule for games I DM: Player’s Handbook (I) races, classes, and options only (for PCs). There’s nothing a player can’t do with the basics contained in that cornerstone rule book and imagination. most of my characters are designed using the core rulebook and the advanced players guide. i have the advanced race guide which gave me a lot of more interesting ideas but the only characters made from thier are a plethora of goblins, each with different clases and personalities. i think by trying to achieve a character personality idea, having the options is great but having so many choices to optimise a character takes it all away from the personality. i liked when we did that sesion of first ed recently, i played a cleric who wandered about just exploring and healing and striking the odd guy with his lucerne hammer. no feats, skills, proficiencies or domains or anything. so relaxed and was a really good gaming sesion. Ah, the Deeping Halls of Arbitrary Malevolence. Happy days! When you move back, perhaps we’ll pick that back up old chum! My staple fighter Jan (a handy back-up I threw together for easy and quick character generation) uses the rules almost exclusively from the Pathfinder Core Rulebook. I’ve added in only three feats in his entire 20 level progression that are featured in 1 extra book (Advanced Players Guide), and could do without those feats in a pinch. Playing him for several levels at different points in his progression, and keeping it simple, has made Jan quite a memorable character to play. He’s simple, solid, not exceptionally good at specific specialized things, but one of the best all-rounders I’ve ever built and/or played. By limiting my choices, I’ve made Jan a character I’m 100% happy with. Not because he’s the best fighter in the game, but because he’s fun to play due to him not being exceptional in every way. I was a 2ed d&d, champions, rolemaster fan for years (ok decades). In the last decade, a friend of mine got me to try a fast and furious system (savage worlds) and it really made me think more about my character and the story. Sometimes its just a new genre or setting that gets the creative juices flowing, but that wasn’t the case here. I think that switching from a rules and chart intensive system to a quick playing system that focuses on the story really changed me as a player and gm. I think that is part of the popularity of systems like Malifaux or Bolt action or “firefly”-esq Delta Vector, LOTR, W40K, etc. Don’t get me wrong, I can spend and enjoyable afternoon working up Champions NPC’s. Your mileage may very, but I have found that rules light systems are more enjoyable. When everyone has the same attributes/skills (or close) and weapon damages are similar, what differentiates your character from the next……..your roleplaying, and if the gm is good they will make rules up on the spot to make your story choices a blast. I appreciate this article and feel that simple is better; only using what facilitates a fun gaming experience and omitting whatever bogs things down. The problem with reducing those very large rules sets to just the core rulebook is that there have often been intentionally badly designed options in those core rulebooks. Monte Cook patted himself on the back for his “system mastery through feats” in 3e, and the same idea continues through today. For example, Paizo just released the Weapon Master’s Handbook, which goes a significant distance to making straight fighters playable. As a GM, I like the idea of running a simple game out of just the core rulebooks, but it doesn’t really work with the modern ideas of balance and character creation in 3e and on. The 10% of that feat from a supplement may make the other 90% of a character viable, and so on. I restrict my games to what I myself have and can read, but I’m pretty permissible within that. I can take 10 minutes in addition to my other prep to read over a new archetype, for example. In Pathfinder, I often find there’s less problems with the new content and more problems with players preparing characters out of an online SRD, which often leaves out or obscures important parts. It’s very important to tell your players you’ll reference the actual books as written, and not an online summary. Love this blog post, it reminds me of something I’ve written now 2 years later and just published yesterday. I honestly have tremendous respect for what you’ve written because I feel like it’s the article I wanted to write but didn’t execute as well as you have. That said, I honestly work very hard to avoid doing this, but don’t make a habit of inserting self-promotion type things, but I would really love your feedback on something I’m working on. This problem has been something that I’ve been torn over for years because I love the creativity of customizing your character, but hate the “splat book shopping” thing that takes hours upon hours. A friend of mine once said, “It’s like with all these books, more and more they keep coming up with ways for you to ‘own’ an ability, which in turn means that other characters can’t do that particular thing because they don’t have the feat”. I’ve tried to take things the opposite direction with a very different approach to how feats / abilities work with Open Legend RPG. I go way back. So far back that I started with 3 little books in a box that *didn’t* say “original collector’s edition” on the cover. Fighting-men. Magic users. Clerics. And with Greyhawk, we added Thieves. Humans. Dwarves. Elves. Hobbits. That’s where the hobby started back then (though there’s prior art from Europe) … and you know what? We had a hell of a lot of fun. I would venture to guess that we had at least as much fun as anyone has today, despite needing a small wagon to haul their rulebooks to a game. I would further guess that the reason was that we weren’t obsessed with picking out the exact right abilities for a character conception more akin to a character in a novel than a character in a RPG. We threw together a character … roll the dice, that’s your new fighter … and had fun. Character generation took minutes, not hours. If there was some history to your character, you made it up as you went along, instead of spending a whole evening planning it out in advance. The original Worldwalker, whose name I’ve been using online for 20+ years, was such a character. A drow elf, to be exact, when they first appeared in UA. A drow who had studied the writings of forbidden gods … which gods would drow forbid? You got it: the gods of good! A drow who had either been blessed or cursed by those gods (I was never sure which) to, after every death, turn up in a different world. (hence the name) That was just something I came up with to explain why I recycled that character through several different campaigns (and eventually as an NPC and frying-pan-to-fire deus ex machina in my own) but it became a part of the character. Worldwalker became fully realized over a couple of years of playing because of what I did, how I played — not beforehand, restricting me to trying to act out the character I’d invented. Because of that, Worldwalker is also far more real to me, in a fictional sense, than any character I’ve ever carefully designed and optimized. So, yeah, I think we’ve gone overboard with the rules and options and variants and specializations and minutia. I said that back when TSR first started spewing splat books, and I haven’t changed my mind about it. If our characters are defined by exactly what special rules apply to them, defined by a page of numbers and stats and notes, where’s the room for imagination? Where’s the room for creativity? Where’s the room for US? It’s been said that a school is a log with a teacher at one end and a student at the other. The same is true of a RPG: it’s a table with a GM at one end and a player at the other. Two kids “playing pretend” in the back of the family car on the way home from Grandma’s are engaging in a RPG, without a rulebook in sight. One person making up a scenario, another person interacting with it. Everything beyond that is elaboration, and it behooves us to look closely at how much of that elaboration we really want to devote ourselves to, and how much of it is impeding, rather than enhancing, our goal. If we start to suspect those two kids in the back of the car are having more fun than we, with our backpack full of books and head full of numbers, are having, maybe we’re doing it wrong. Give me simplicity any day, I much prefer a light OSR game with one rulebook; characterisation can be provided through background, roleplaying and core options. As I GM I like to have a decent grasp of the rules and what the characters are capable of and don’t want to be caught short when a canny player tells me their character is going to use X ability that I had forgotten about which totally undoes my plans… Don’t get me wrong, I’m all for player creativity to challenges, but I like to understand the parameters they can operate in. Although I have the Pathfinder PDFs (thanks Humble Bundle) I don’t think it’s a game I would ever run. Even the 3 core books of 5e feels too much.. I think this is an optimization issue not an options issue. Having lots of options is really only a problem if you’re in an optimization arms race. I do like having the option to play a Tengu Spiritualist (my current character) not because it’s more powerful or whatever but because it’s a cool concept. And the SRD helps a lot with needing to carry around rule books. Also I don’t know how a publisher can stay in business without books. At Raging Swan Press we’ve managed to struggle through six years (or so) without printing almost any PC option books (probably 1% of our output has been player focused). For me, it’s all about publishing what will make the game better. As someone who runs games and seldom generate characters, my take may be skewed – a bit – but, I think it falls to the GM/DM/Referee/etc. to rule what will and will not work in their campaign. The books and options are just that, a literal library of possibilities, which should then be trimmed down to fit the campaign, style, tone, and range of the game being played by the group. Not every option fits in every world, country, or reality. My players need to provide justification in their character backgrounds to support the options they want to play. They know that I may tweak things or have outright objections due to the nature of the game I run and how things fit in to the worlds we play in. Characters need depth, story, rationale, and a level of detail that gives me what I need to properly set them in the game. They players have to work for it, or it doesn’t happen. Talk to your GM, have a group discussion, set the limits of the campaign, then hit the books. I think you’ll find it’s not quite as daunting a task. I like to simplify my options. The limits actually boost my creativity – how will *I* make this next character different and interesting? Also, my enjoyment of the game isn’t in a really perfect build, its in the story, the DM, the interesting things the dice do and the other players! It’s a social event. A couple of my gaming friends were having a similar discussion this morning – about game bloat. It’s hard not to buy all the books when people are excited about them, it may limit the online games I get into when I don’t have some of the information in those books, but I don’t really need them unless they are great. I can wait to find that out. I have a very basic set of books, but even so, I have 8 books and they aren’t cheap! I have been playing since 1ed, and have never really found the need for an Abraxi Grave Robber with the Run through the Brairs feat (obviously, my creation)… I have always played the basic PHB races and classes, and ahve required my players to use only the PHB classes and races, and have, in almost 40 years of playing only ever had 1 player who complained, and he demanded (atg my table) that he be alloewed to create a gesult character with off races and all sorts of special features and skills and such that made him, practically unkillable (except that I am the DM… I can kill anyone)….